1) I am organized to the point of neurotic. My current fixation is a comparative flow chart of the prices of commonly purchased goods in the three different grocery stores in my area. I use this list to go from store-to-store, finding the best deals. The money saving is secondary to my sense of organizational accomplishment. Seriously. 2) I eat frozen peas when I write. 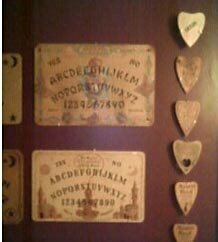 3) I have a collection of ouija boards hanging in my upstairs foyer. I never use them. While I really don’t believe much can ever happen from a previous owner’s sessions with the Other Side, I still sage them before I hang them–just in case. 4) I have a weakness for eye makeup and firmly believe Sephora is my mother ship. 5) I bought “The Anarchist Cookbook” from Amazon in a fit of rebellious anger, just so I would be put on that rumored FBI list and waste their Bradburian time. 6) Indulging in some magical thinking, I had a tattoo done over the surgery scar on my lower back. The rationale was: I was never going to let a doctor damage my ink with a scalpel, so I would just make sure I never had to have back surgery again. It’s worked so far. Now for my victims: Christina, Spy, Steve-O, Lana, Sqt, and Kate (if you’re around). Charles, you get a link just for the hell of it, but I’m not tagging you because I know you’re not a big fan of these. But, the rest of you best pony up the goods! This entry was posted on Friday, May 16th, 2008 at 4:29 pm	and posted in foolishness. You can follow any responses to this entry through the RSS 2.0 feed. And I meant flak. It’s late. Forgive me. Barbara — Thanks for the pea support. I’ve gotten a lot of flack for that little revelation. Wierd is very good…it sets you apart from the crowd.Eating frozen peas while I write sounds wonderful, now that the heat has arrived in Toronto. Thanks for that tip! I used to be organized. Two kids, a messy husband, and a hurricane later, now I’m just neurotic. Maybe the frozen peas will help? Lana — I’m heading over now to take a look. Thanks for playing! Charles — Calling me weird just proves my earlier suspicion; takes one to know one! I wanted to tag you, but I was pretty sure you don’t like these things that much, so I decided not to impose. You got the symbolic “tag” instead.Steve — That’s too bad. I like emails that aren’t bills or spam (which constitute about 99.98% of my inbox). I match your tear. Those are some spectacular quirks. Especially the Ouija board one and the “frozen peas.” And you called “me” weird? I did buy that book on poisons for writers so maybe I’m on the list. I also bought a copy of “The Satanic Verses” so I’m probably on some list in Iran. Thankee for the link. Maybe you aren’t “that” weird. No, I take it back, you are. Steve — Try ’em before you go throwing around words like, “Weird.” They’re surprisingly good.Christina — I wanted to react to the foolish notion that the printed word is dangerous and readers of it must be watched. That was the best way I could figure. You wanted to be on the FBI’s list? So did I, but I chickened out from buying a book on : A Writers Guide on Poisoning.Now I really wish I got gotten that book. Wow, you are one weird chick… very nice, very cool, but… frozen peas? !Actually, those sound kind of good.I’ll do mine after work tonight, or tomorrow morning. Sqt — I seriously doubt that (actually, I doubt those; both of your statements have zero basis in reality). You are so much cooler than I am. I fear my list will be seriously boring in comparison.